As promised earlier, here are some swatches from the Urban Decay Naked 2 Palette. These have been swatched using a brush over primer. Firstly a reminder of the shades in the pan. Rollover the above image to reveal the shade names. 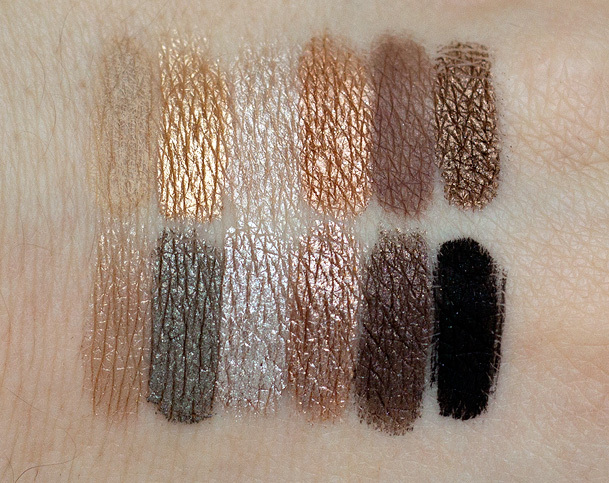 Also check out some swatches on a darker skintone courtesy of VexInTheCity. Come back this lunchtime for a quick comparison between the Urban Decay Naked 2 Palette and the original Urban Decay Naked Palette where I share my thoughts on whether you really need this one in your collection or not. OMG! What a SUBLIME black! Oh those are gorgeous!! I love the gold- half baked, beautiful! Pistol, Tease and Busted have my name all over them! Booty, Tease, Verve and Pistol! What a great song title that would make. Oh God, it looks so similar to the first one but I will definitely buy it anyway… I’ve already hit pan on a few of my Naked palette shades so it’s like an investment for the future, really… right? Looks very similar to the first one, but lets face it, I’ll probably still buy it! Would have been nice to see a more matte based palette though! It does look lovely. I don’t have the first one, but I might cave for this one! Ah, finally! Glad your site’s recovered, I was getting worried.